The fashion for murals has been in favour, arguably, since early people painted on cave walls. It's imagined now these cave drawings and paintings were to assist with story-telling, and developing hunting strategies. Some also marked sacred places or commemorated important events. I have to also think that sometimes people just like to make art, too. 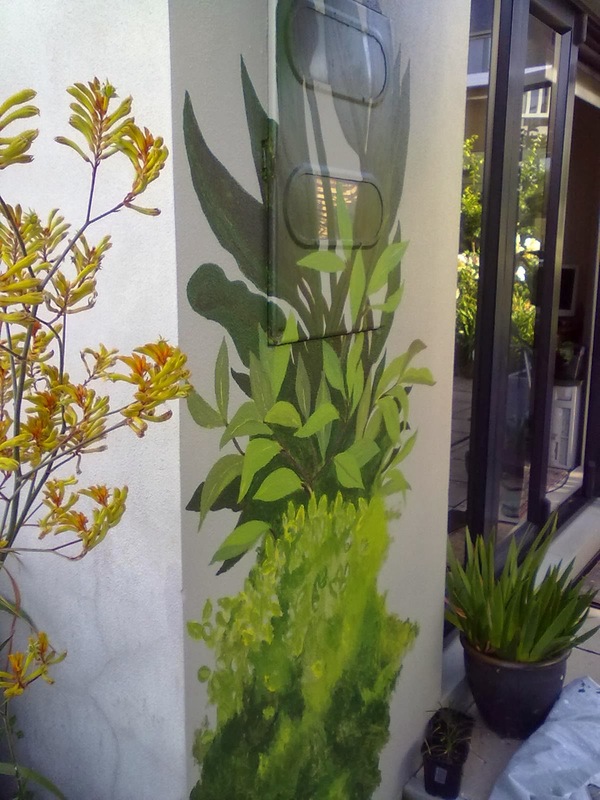 Recently the beekeeper who inspired my poetry book, A Bee Lover's Poetry Companion, after seeing all the murals in my house, asked me to paint a mural in her garden. 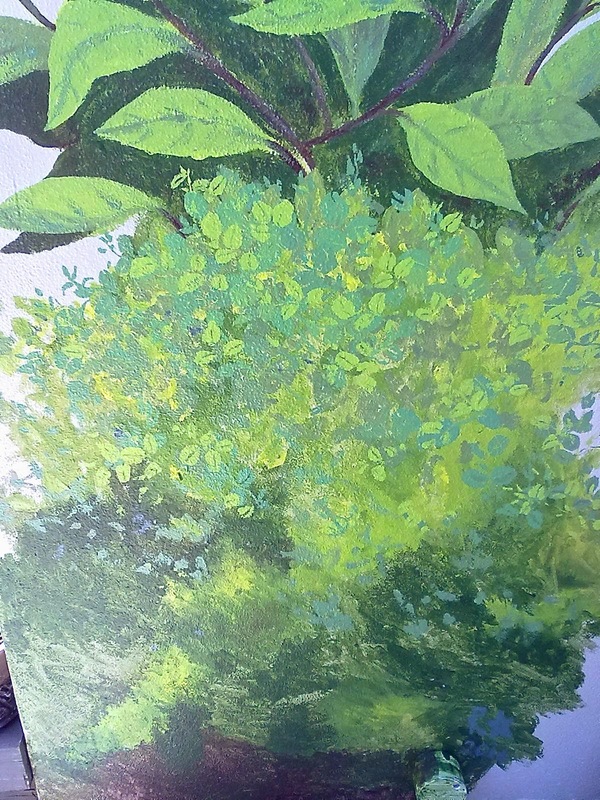 This is the second day, still not finished but mainly sketched in with under-painting. Pt Chevalier, Auckland, Aotearoa New Zealand if you want to. 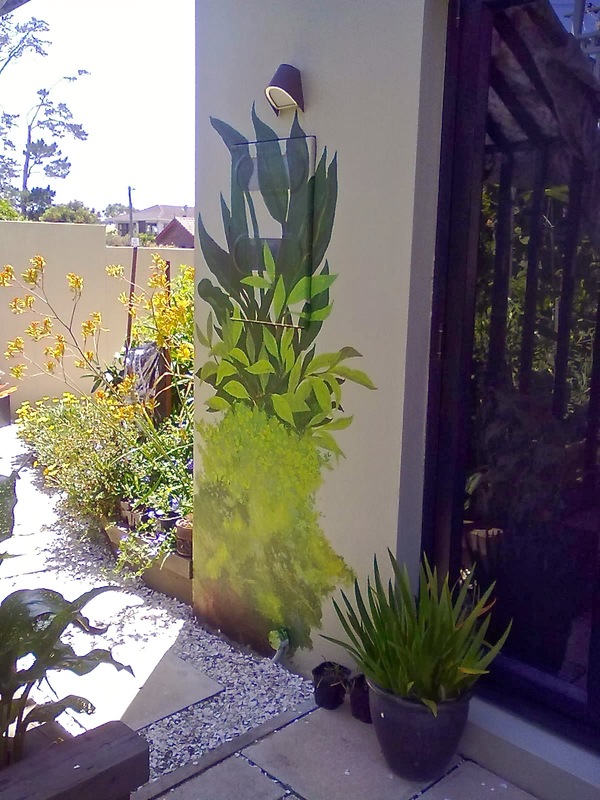 After five layers of paint where the foliage is detailed, the effect is quite realistic. 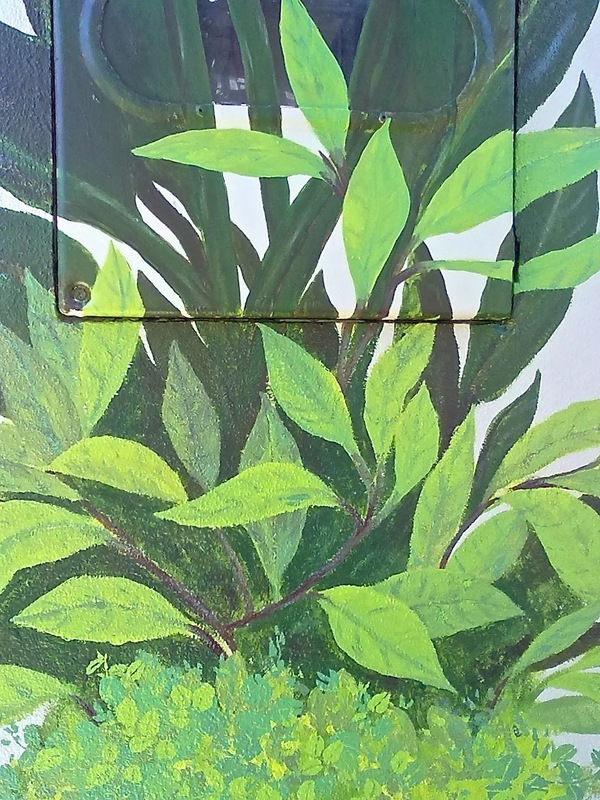 But the lower portion was more impressionistic, which suits the mural's purpose and location. area to paint, each square metre costs a certain amount. 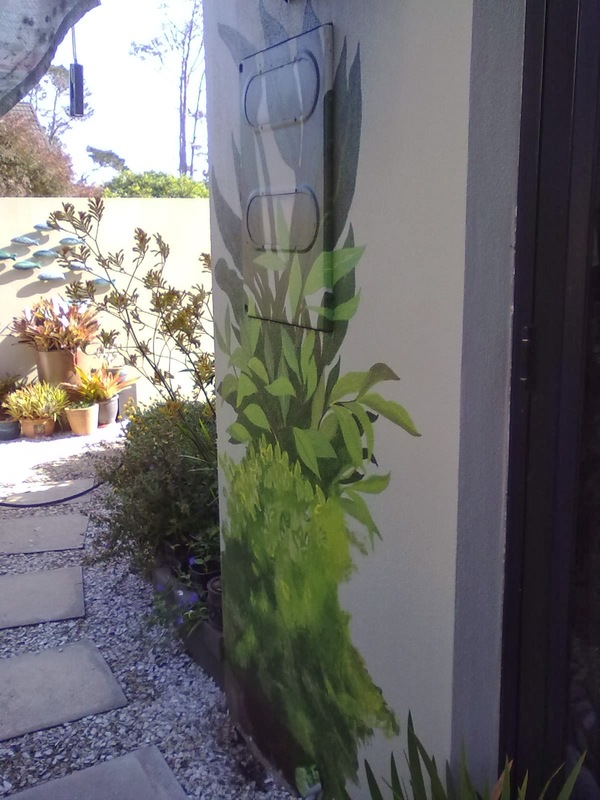 The following pictures show the mural finished, details of it, some of the surrounding garden, and also my friend's bee-hives. 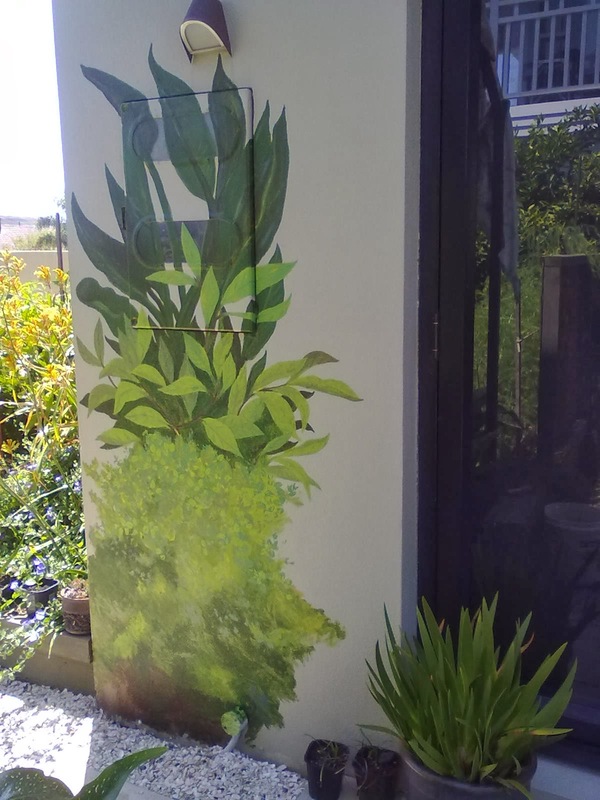 Now the mural fits in with the garden, and the box on the wall is not so obvious. 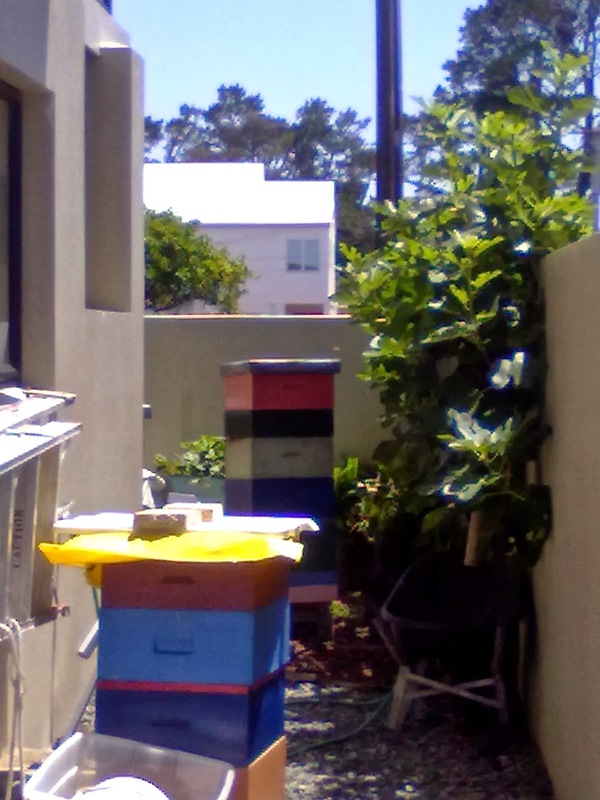 One hive is new, it houses a swarm now until winter comes and it can be moved. My friend has enough work to do as it is, she cannot take on more bees permanently. 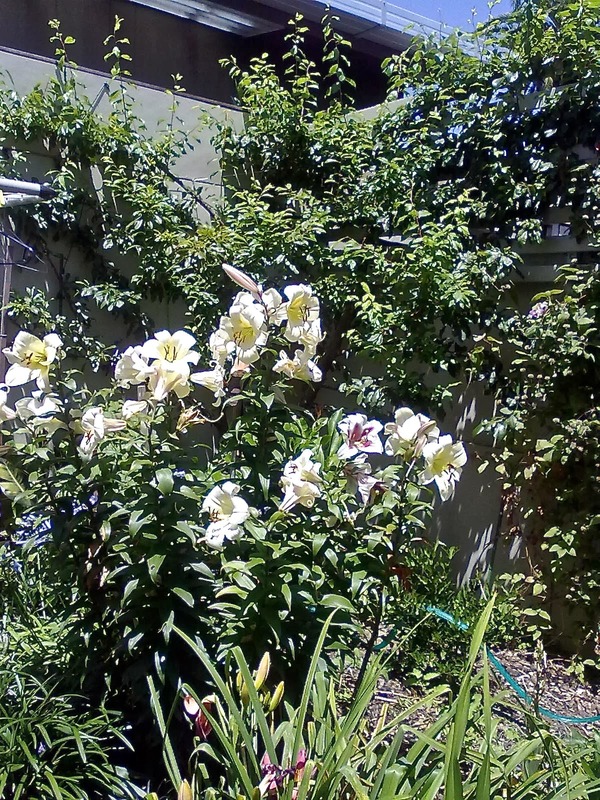 The bees swarmed near her place so they were best kept there. Bees usually like to stay where they choose. In winter bees can be more easily moved, however, somewhere else. Now is 'the season' for bees, lots of flowers out for them to gather pollen. 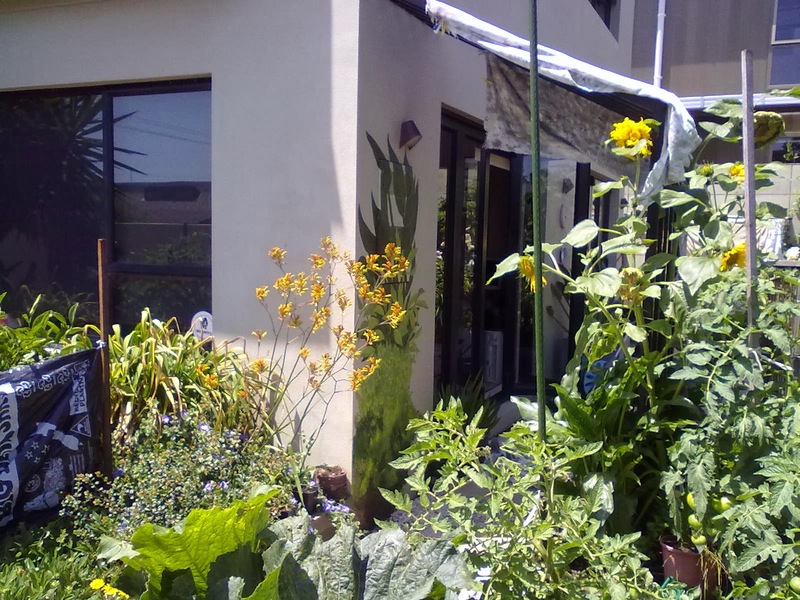 I still have some trees to give away if people would like a Totara, or Kowhai tree. I have no more room on my own property for trees. The old plum tree damaged in a storm has blossomed this year, thank goodness, after a hard prune. Some painted areas were to stop it getting disease. 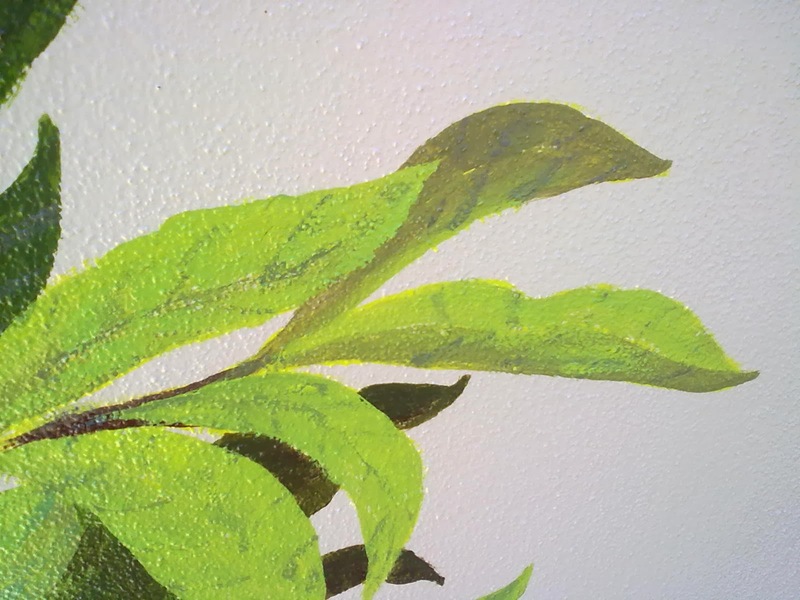 There is a special paint to use to cover where a branch is lopped off. Plums need to be pruned in summer, not winter or autumn, they are susceptible to a disease in wetter months. It has given us plums faithfully for years and is about 80 or 90 years old I think. It is such a wonder, even the lopped off branches cut up for firewood and left in the grass a while started to sprout. I put some of them in places where they could grow. Now I am making plum sauce and plum chutney from the plums. 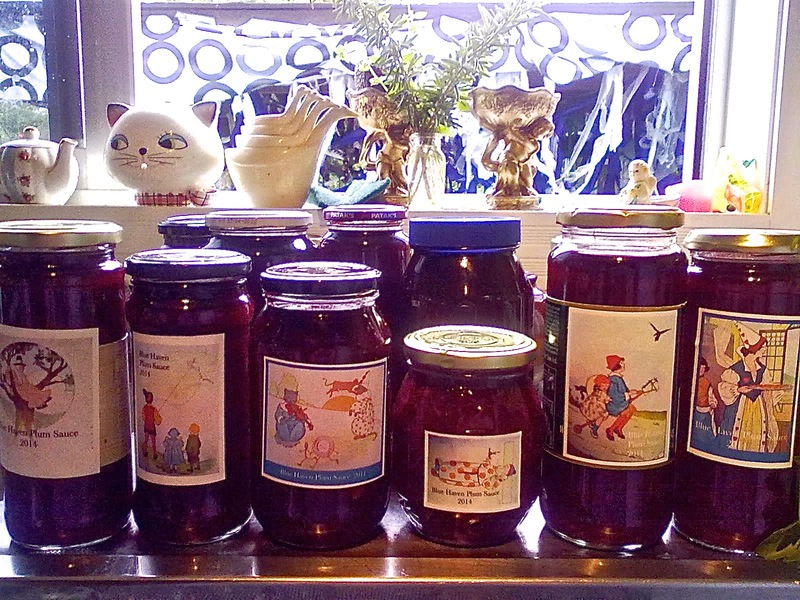 These are a few jars of the sauce, with photos of illustrations from Mother Goose c.1916, as labels. 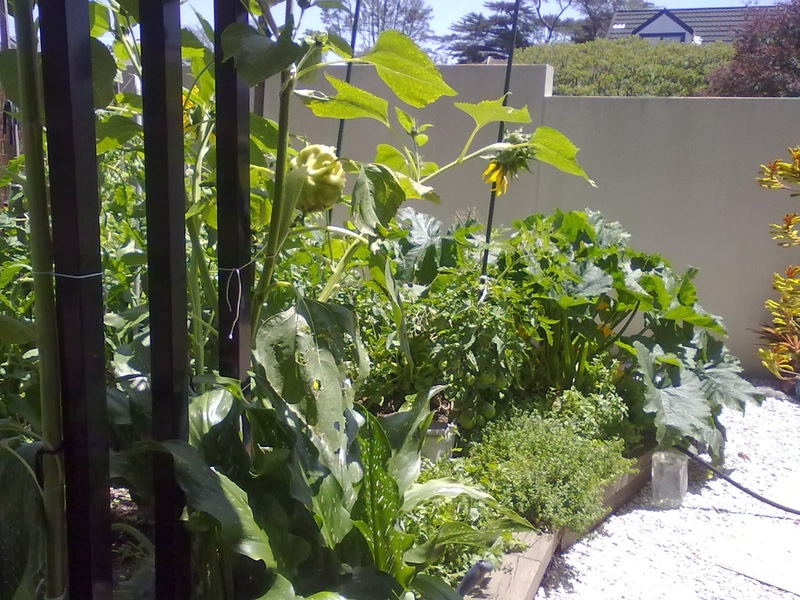 Any comments welcome and thank-you for reading my blog. Please keep buying trees for travel. In NZ we can buy trees for Australia, they really need them. Planting trees properly anywhere greatly assists human beings to live well. I consider we are symbiotic with trees, they give us oxygen we need, we make carbon they need. Please care for the places you live, and each other. Happy New Year for 2014 - may our future improve by what we do today.